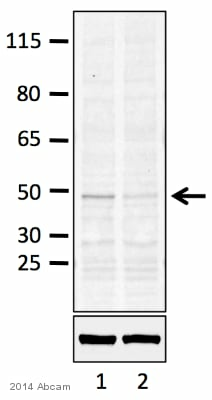 Synthetic peptide within Human Aurora A aa 350-450 (C terminal). The exact sequence is proprietary. Our Abpromise guarantee covers the use of ab52973 in the following tested applications. WB 1/50000. Detects a band of approximately 46 kDa (predicted molecular weight: 46 kDa). Formalin-fixed, paraffin-embedded human cervical carcinoma tissue stained for Aurora A with ab52973 (1/100 dilution) in immunohistochemical analysis. Inset panel is a larger magnification of the image. Inset panel is a larger magnification of the image. Publishing research using ab52973? Please let us know so that we can cite the reference in this datasheet.